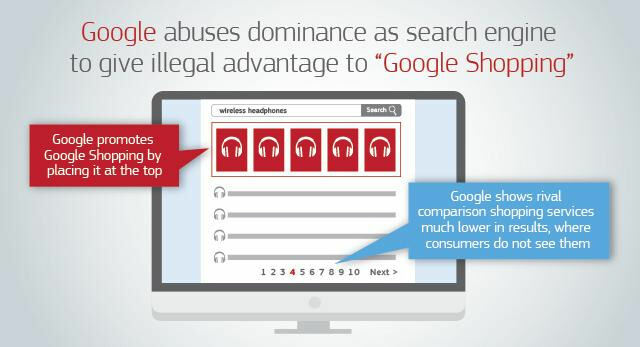 Earlier this month the word on the street was that Google was likely to get fined around €1 billion for abusing its dominant position in search by favouring its own shopping comparison service in some search results, so the eventual fine of €2.42 billion is a fair bit more. As ever with the EC this case has been dragging on for a while, but having made its mind up there’s probably not much Google can now do about it. “Google’s strategy for its comparison shopping service wasn’t just about attracting customers by making its product better than those of its rivals,” said Commissioner Margrethe Vestager. “Instead, Google abused its market dominance as a search engine by promoting its own comparison shopping service in its search results, and demoting those of competitors. Most of the rest of the announcement dwells on how exhaustive the investigation was and how it arrived at the final fine amount. It seems that Google is still committing this ‘illegal conduct’ and the EC has given it 90 days to pack it in or face fines of up to 5% of the daily turnover of its holding company Alphabet. If you’re still having trouble getting your head around what Google is being fined for the EC produced the handy graphic below. In his response to the fine Google General Counsel Kent Walker tried to plead altruism and that Google only ever had the interests of end users in mind. Even if we accept that claim at face value, empowering the consumer has been enormously profitable for Google – to the tune of around $20 billion in 2016. Google will probably appeal but it’s unlikely to win and, as the UK is currently discovering, Europe is not currently inclined to give ground. What else isn’t being shown to us? It’s time to take the internet back from the monopolies. Between tracking every search you make and all your activity with your smartphone, it’s getting pretty scary.